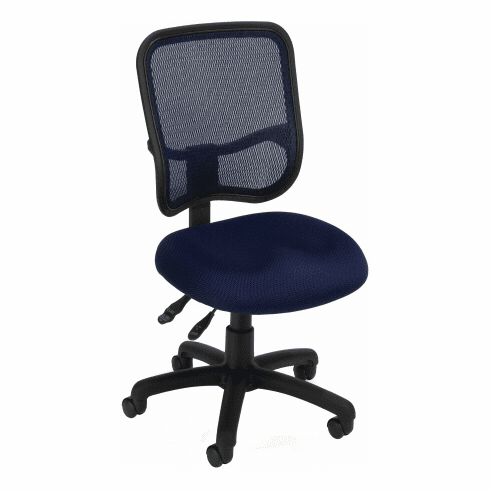 This ergonomic office mesh chair from OFM features a screened mesh backrest for the ultimate in temperature control and support. Other features include a thickly padded fabric mesh seat with stain protection, 360 degree swivel, pneumatic seat height adjustment, seat pitch adjustment, back height adjustment, back pitch adjustment, built-in lumbar support and a heavy duty nylon base with dual wheel standard casters. Optional adjustable T-shape arms are available for a minimal charge. This chair meets or exceeds ANSI/BIFMA standards. Dimensions: Seat Size: 19"W x 17.75"D x 3"Thick. Back Size: 17"W x 18"H. Seat adjusts from 18.5" to 23"H. Limited lifetime warranty from OFM. These ergonomic mesh chairs normally ship within 1-2 business days from our NC warehouse.